The attention of the NZ orienteering world now switches to the 2013 Super Series and first up the Auckland Champs this weekend. to be held on Woodhill and somewhere "out east" for the sprint distance. Here is a chunk of the embargoed middle distance map (I wish Wellington Orienteering Club would adopt the Auckland Orienteering Club policy of embargoing an area for two weeks before a competition). This is typical Woodhill terrain: detailed coastal sand dunes, with a narrow open coastal strip backed by a denser pine trees with some vegetation detail, one or two soft windy motorbike tracks before Coast Rd itself. On the eastern side of coast road there are broad dune landscapes with a consistent amount of detail. 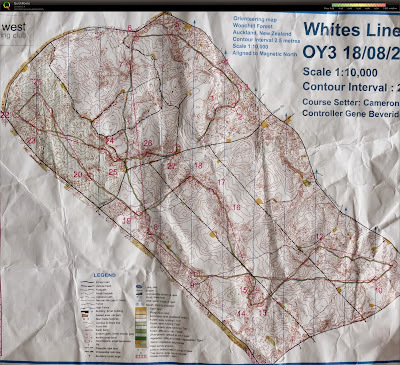 The organisers have not stated how old the trees are in this block currently, so runnability and especially visibility will be determined on the day but here are some basic rules for Woodhill navigation. Every time you take a weak option, looking for a short cut that doesn't exist, or contouring around a hill you have to climb anyway, you are running further, and probably slower, than your opponent keeping tight to the line. Matt Ogden, and the likes of Toby Scott and Gene Beveridge, are the heirs apparent to the former masters of Woodhill, Alistair Landels and Darren Ashmore who first realised going straight was a good first golden rule for orienteering on Woodhill. If you exit each control correctly Woodhill is now your oyster. The detail that seemed murky to you before will roll out in front of you along the red line in crystal clear 3D. Starting on the right line is the equivalent of engaging auto-focus on your camera. No 7. No variation from line. Tricky control but no detail left or right of the control to bounce off. 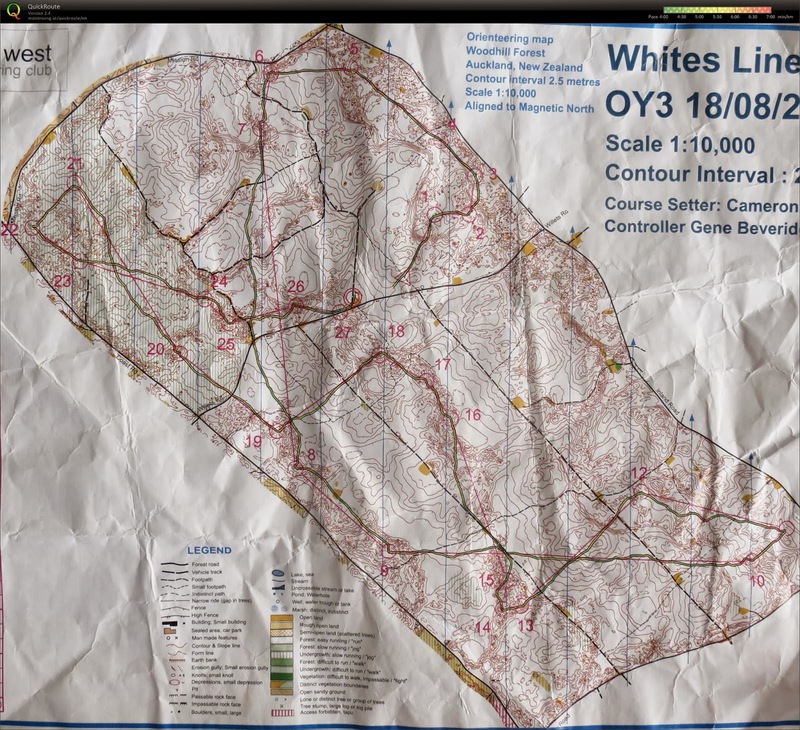 Note double contoured knoll 220metres out that Matt ran straight over (200metres between the grid lines on a 1:10,000 map). The only handrail from there is your compass. Read the two depressions, run up the vague spur to the re-entrant just before the top. No 10. Variation left through saddle to attack control from top of prominent re-entrant. Note how Matt slowed down in the re-entrant after the saddle to ensure he executed the final part of the leg properly. No 13.High speed leg with two prominent stepping stones before Coast Rd, the big hill and the clearing, note how Matt skirts both. Attacking 13 Matt veers left to use the large open hill on his left to steer him into the control down the re-entrant. Leave the line, you're losing time.